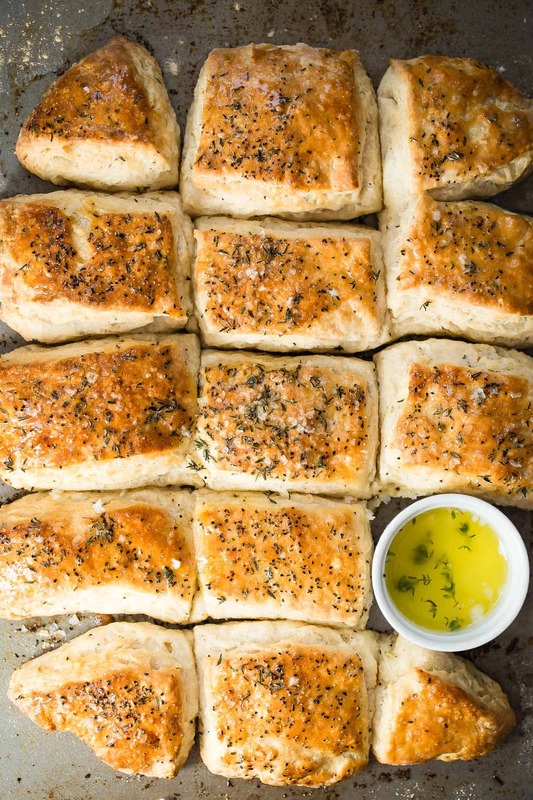 Light and flaky buttermilk biscuits with a savory garlic and herb butter glaze. These are the best biscuits I have ever tasted and always are gone on the holidays! What is it about biscuits that make them perfect for everything!!! Maybe it’s the ridiculous amount of butter that goes in them or the flaky pillow-light texture, or that they’re so easy to make. Who cares because once you try these savory buttermilk biscuits, all you’ll care about is how you can score a second one at dinner before they disappear. It’s almost holiday time and Thanksgiving will smack us in the face with traditional solid recipes like green bean casserole, stuffing, gravy, all the good stuff. You have a good idea of what you’ll be eating next Thursday in some form or another. I ain’t complaining, I love all. of. it. 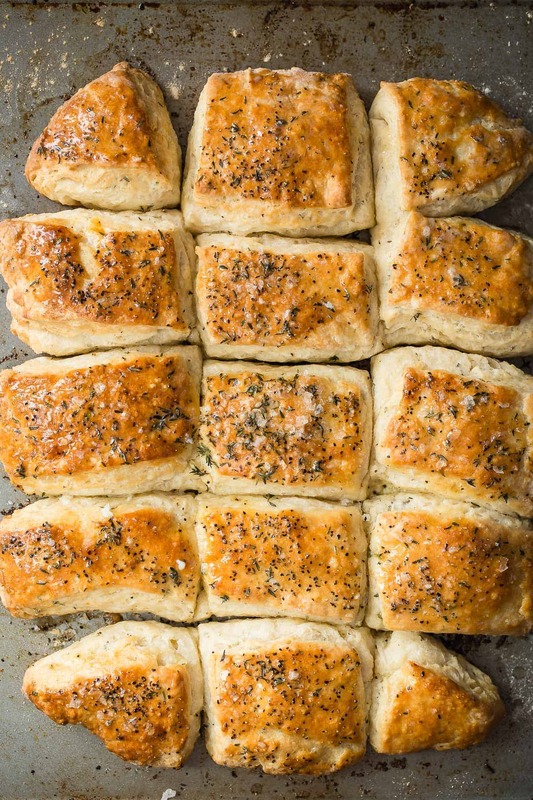 Dinner rolls have a special place on the table too, but this year you should change things up a little and make these biscuits. Flaky and light don’t be surprised if you see some of your guests stuffing them into their pockets. 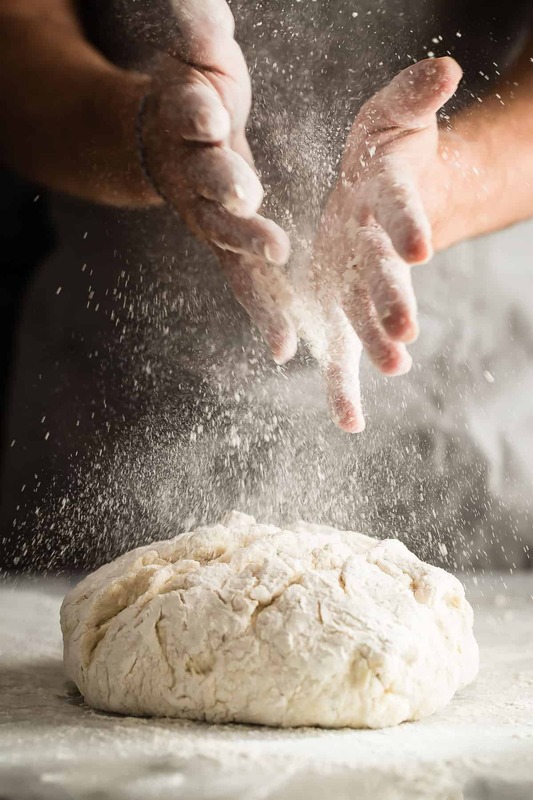 It all starts with the dough. This isn’t like making bread, it’s soooo much easier because there’s no kneading and no rising. In fact, you want to handle the dough as little as possible. Almost half a pound of butter is used plus even more is brushed over the rolls as they come out of the oven. Is too much butter even a thing? Get that dough nice and flat, about 1 1/2 inches thick. Not too flat, though, we don’t want to kill the dough that we’ve been handling like a baby hamster for the past 10 minutes. Brush each biscuit with beaten egg because we want our biscuits to look nice and shiny and dapper. Sprinkle with sea salt, the flaked good stuff, cracked black pepper and lots more fresh thyme. You can skip the garlic bath at the end if you like, but why on earth would you turn down more butter. I was pretty amazed at how the melted butter soaks right into the biscuit without any feeling of being greasy. I hereby rest my case, pass on the bread rolls and go biscuits! 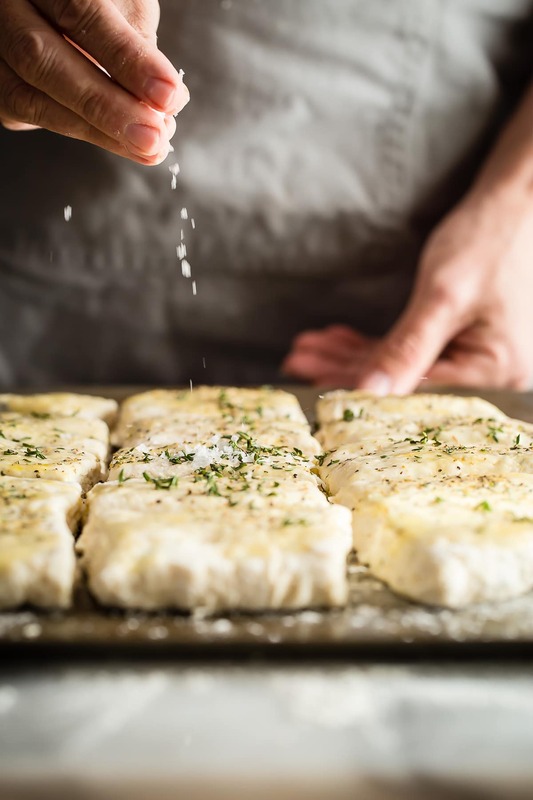 Flaky and light, these buttermilk biscuits are flavored with fresh thyme, sea salt and cracked black pepper. As soon as they come out of the oven, glaze them with garlic butter for the perfect side to any special dinner. Preheat your oven to 415 degrees F. Dust a large cookie sheet pan lightly with some of the flour. In a bowl combine the flour, baking soda, baking powder, 2 tablespoons of the chopped thyme, salt and seasoning. Whisk with a fork. Chop 12 tablespoons of the butter roughly into cubes and place in the flour mixture. Using a pastry cutter or your fingertips, break the butter down by rubbing it with the flour until it becomes pea size. Add the buttermilk and slowly stir until most of the dough has come together. Dust your table with some flour and dump the mixture onto it. Without working the dough too much, shape it into a ball. If it becomes sticky add a little more flour to the table. Roll the dough out in the shape of a rectangle to a thickness of about 1 inch. Using a pizza cutter, slice the dough into a grid to produce 15 square biscuits. Don't worry if the corner ones are a little smaller. Transfer the biscuits to your pan making sure to keep them in the same formation that you sliced. Place them close to one another on the pan. Brush each biscuit with the egg and sprinkle with the remaining 2 tablespoons chopped thyme, sea salt and black pepper. Bake in the oven for 25-28 minutes and golden brown. Melt the remaining 4 tablespoons of butter and add the garlic. Once the biscuits come out of the oven, brush them liberally with the garlic butter. These look delish and how perfectly on time for turkey day! These would be so good on the holiday table! Wow, great photos! This is a great post! I feel like rolls have to be reallll good to get my vote on Turkey Day. And these definitely do. Now hand them over! Wow, these looks so good and such gorgeous pics! SO beautiful. This looks like the perfect addition to the Thanksgiving table! I love the action shots, these biscuits are perfection! the most beautiful biscuits ever! 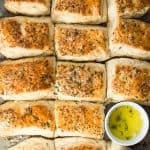 I love thyme in bread – I need to make these! I really love that shot of you smacking your hands in the flower flying everywhere. It sounds like a great biscuit recipe and I can’t wait to try it. Ahhhh, these photos are amazing!! These are stunning! Adding them to my to-bake list for sure. Love the photography, too! Love the name of your blog – so fun to say! Also love these biscuits with fresh thyme and garlic. Canadian Thanksgiving has passed but I don’t need a special occasion for these. Great photo and I’dove to draw it ! If you used spelt flour would adjust the recipe?